Have you ever needed a specific piece of equipment, but couldn’t afford to purchase it outright? In this situation, you may apply for a research grant, ask fellow researchers to borrow their equipment, or avoid conducting the experiments altogether. Another alternative is to use a core facility. Core facilities were created as a response to an unmet need: researchers wanted access to several pieces of state of the art technology, but could not afford to purchase them all for their own lab. Core facilities are designed to help researchers avoid the large upfront costs of purchasing equipment, but they also help you avoid the long term maintenance and repair costs. A well-run facility will provide users with tailored training so you can optimize your experiments prior to running the instrument. Many core facilities have experienced technicians and users who become experts at maintaining expensive equipment. Core facilities are also beneficial for equipment that needs to be upgraded or replaced often. There’s no doubt that core facilities are crucial in research. However, sharing equipment in a core facility can also have some drawbacks for researchers, especially in a poorly-run or poorly-funded facility. Whenever practical, researchers should aim to purchase their own equipment, and use core facilities and other shared equipment for experiments that are conducted infrequently or require the expertise of those running the core. Experiments that are run frequently would often be more efficient to perform in a researcher’s own lab. Conduct experiments on your schedule – Purchasing equipment allows you to use your device whenever you need it. Experiments can be run 24 hours a day if necessary, and you won’t have to wait for another researcher to finish up before you can get started. Core facilities often have scheduled hours that you cannot work outside of, and equipment bookings may need to be made weeks, or even months, in advance. Minimize your cost of running experiments – The upfront cost of purchasing equipment is undeniable. However, once it’s in your lab, your fees are reduced to consumable costs, and occasional maintenance and repairs. A core facility, in comparison, charges you user-fees and will sometimes mark up the cost of sensor chips. Now that an affordable, benchtop SPR instrument exists, using a core facility can actually be more expensive over time than buying your own equipment. Purchasing equipment also provides you with an added financial return of renting time on it to other researchers or selling it at the end of its usable life. Core facility fees Vs. OpenSPR: Cost of using Biacore surface plasmon resonance instrument at Stanford University over a 6 week period (assuming setup each day, full day of testing, ½ day of data analysis per week, and a new sensor chip each week). 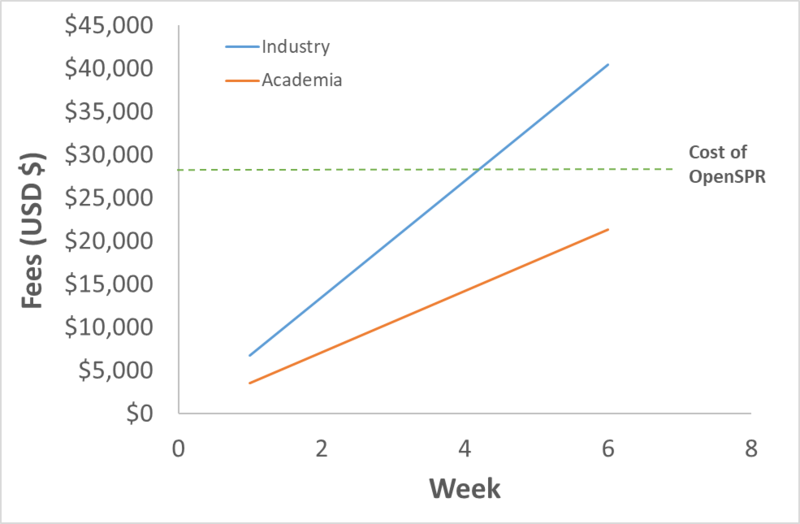 Orange line shows cost for academic users and blue is the cost for industry users. Alter your equipment as you see fit – Once your equipment has been purchased, you have the freedom to modify it to suit your lab’s needs. In a core facility, you are not able to fundamentally alter the equipment. You may be able to get around this by bringing in your own additional hardware and then removing it when done. However, this requires additional setup time in the core facility that you will likely be charged for. Take as long as you need to conduct experiments – Due to the high number of people wanting to use core facility equipment, you are often given a rigid schedule, with limited time available to use the equipment. You may also be charged per hour, and want to limit your costs by completing experiments faster. Both factors may cause you to rush your experiments. Owning your own equipment allows you to run any experiment that you want, providing adequate time to optimize your SPR experiments. Keep all your research in your own lab – The closest core facility may be on another floor, in another building, or at a completely separate campus location. You will need to transport your samples between your lab and the core facility, while maintaining sample quality. Conducting experiments in your own lab eliminates this altogether. Avoid cross-contamination & downtime – Cross-contamination can be very difficult to avoid in a core facility. Multiple users are conducting experiments on the equipment, and the instruments may become contaminated during maintenance or repairs. Although your own equipment can still become contaminated, the risk is much lower as you have a much better idea of the experiments that have been completed and can clean accordingly. Due to a large number of users, equipment in a core facility often needs maintenance more frequently. Although core facilities have experienced service technicians and managers to fix these problems, you have no control over how long this process takes. You rely on the schedule of the core facility, meaning you have to press pause on your experiments until the equipment can be fixed. With your own instrument, you can expedite maintenance or repairs as needed. Train at your own pace – Purchasing your own equipment allows you to learn how to use it at your preferred rate. If you need to conduct a time-sensitive experiment, you can complete training quickly and finish the experiment on time. If you’ve got more time to play around with the equipment, you can plan various experiments to learn about the different functionalities of the equipment. Core facility training does not provide you with this freedom, and is often complex on instruments such as those used for SPR. Conduct your own experiments – Some core facilities will not let you do any of the work, employing a designated technician. The technician will run your experiments for you, giving you limited control over your experiments. If there is no technician, you might have to pay a hefty price to travel and get certified on the instrument by the manufacturer, costing you time and money. Running your own experiments gives you the option of making changes in the middle if you notice something is not working correctly, or discover something interesting that you want to explore in more detail. Buying your own equipment is an excellent solution/fit for researchers who have a good idea of the equipment that will be used on a daily or weekly basis. Purchasing equipment is a great way to get the most out of equipment with a long, usable life. Core facilities have their pros and cons, but ultimately the choice to purchase equipment depends on your unique situation. If it makes sense for your lab, we encourage you to purchase your own equipment. But if not, core facilities are a great alternative, providing you with the equipment you need. Adding SPR into your lab isn’t as expensive as you think! OpenSPR is a user-friendly and low maintenance benchtop SPR solution backed by hundreds of researchers.